I always like recreating something I’ve had at restaurant, friend’s house, or more commonly my mom’s food. Recently, my friends and I went to the Dine About Launch Party in San Francisco, where we tasted items from about 20 or 30 restaurants. It was a blast. I definitely had a hard time saving enough room to taste everything (I failed because beer). 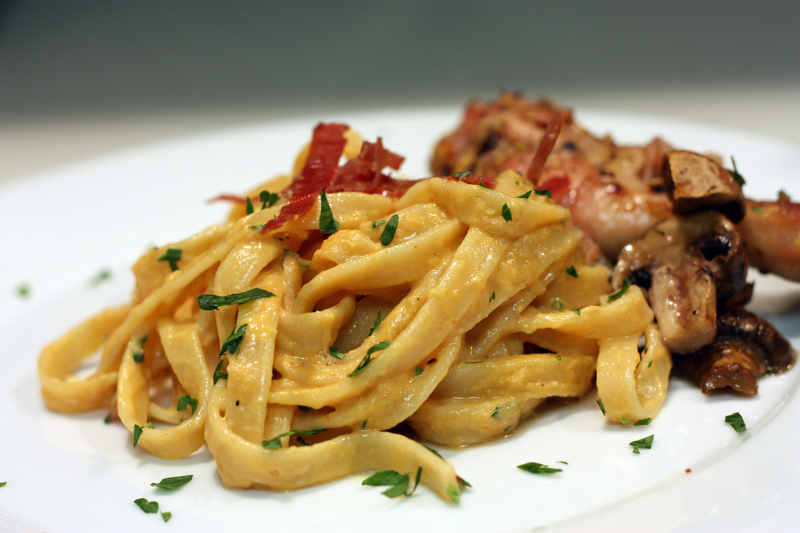 I had this pasta dish from an Italian Restaurant there. Alright I forgot what it was called, but I’m sure I can find out. Anyways, it was more of a blind taste test for me because I did not know what pasta I was eating (didn’t bother to look at the sign). But some flavors were distinct, prosciutto, tomato, and truffle. Probably one of the best pastas I’ve ever had. So in my mind, I had to recreate it. This is my take. Basically throw all the ingredients except for the cream, truffle oil, and basil into a saute pan and saute for about 5 minutes on medium high heat. Let everything come together and then toss the mixture into a blender. Blend as finely as you can. You’ll need to scrap down the sides. Return the mixture to the pan, and heat through on medium heat for a couple of minutes, just to let everything melt together a bit more. Add cream and stir well. Finish with the truffle oil, basil, and cheese. Toss this with cooked pasta. I wanted something big, but all the had was fettuccine. I served this with some roasted chicken, and it was fantastic. By far my favorite pasta (sorry seven hills you’re too expensive to eat often!). Definitely give this one a try. It’s crazy easy to make, and will definitely wow any of your guests! 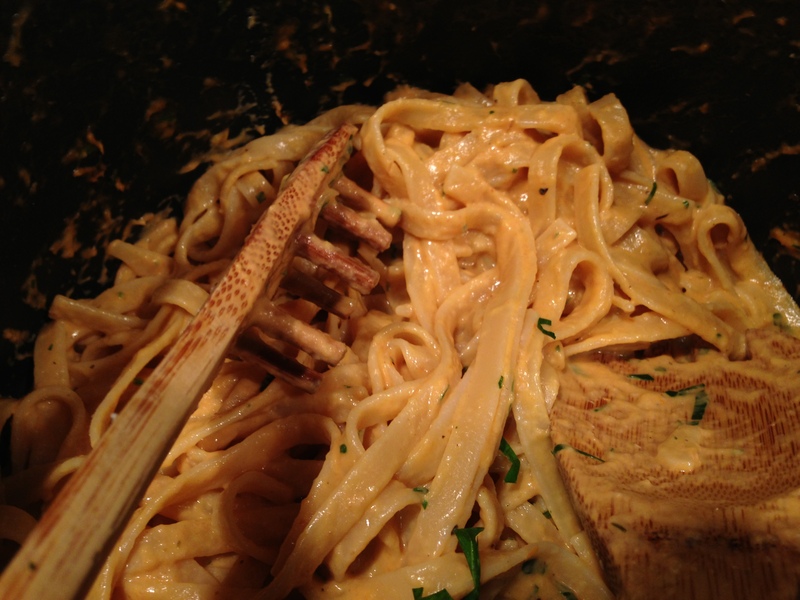 This entry was posted on February 22, 2013 by rrfoods in Dinner, Pasta and tagged blender, cream sauce, Dinner, fancy, fettuccine, garlic, parsley, pasta, prosciutto, tomato, truffle.